Somewhere at the edge of dreams, at the edge of night and day, a golden hare races through the dappled flowers and grass. Chasing the shadows between sun and moon he runs over the mountains curving paths at the very edge of our awareness, trailing stars in his wake. The long dark fingers and shadows of night reach for his golden fur, and he runs onwards, towards dawn. He beckons us and dares us to follow his wild path, far from the known world, along the edges of our dreams. He shows us how to trust our deepest instincts when we don’t understand the world around us, when we’re reaching for something new. Will you follow? 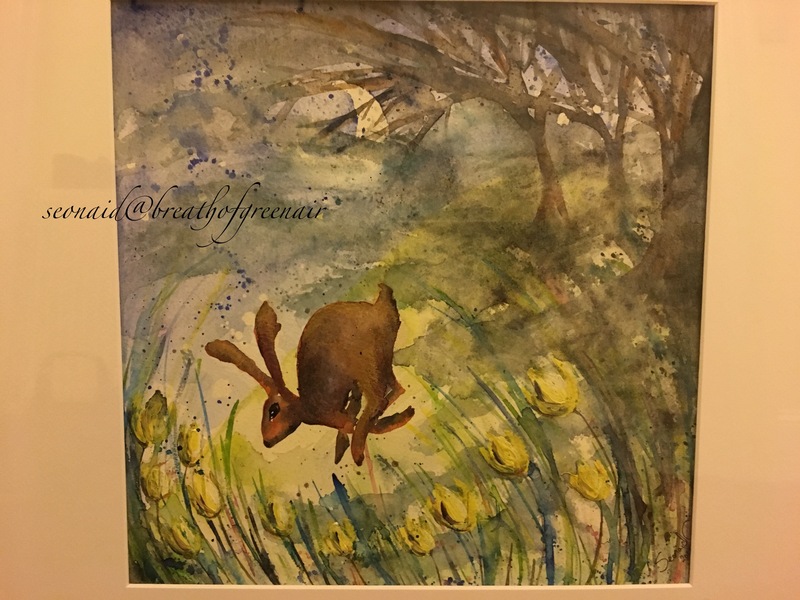 This entry was posted in art, Elemental tales, mythology and tagged animal, art, dreams, fairytale, hare, magic, myths, painting, totems, watercolour. Bookmark the permalink. Gorgeous painting. I would love it on my wall! You are magic, through and through. What a beautiful painting! I could look at this all day. I’m sure your exhibition will be a big success. By now your paintings will be on the walls of the exhibition. I’m sure they will be well received as they are so fluid and the colours so warm and inviting. 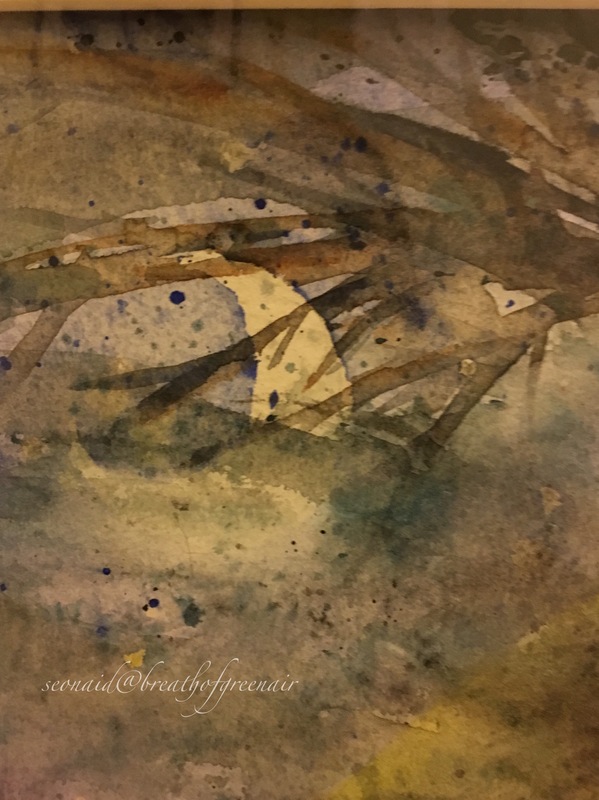 Glorious watercolour Seonaid … a lovely light touch … love love love it ! Your posts continue to inspire and delight, Seonaid. I’m not the least bit surprised you’re a beautiful painter. Thank you :). You are so clever! Best of luck with the exhibition. How exciting! 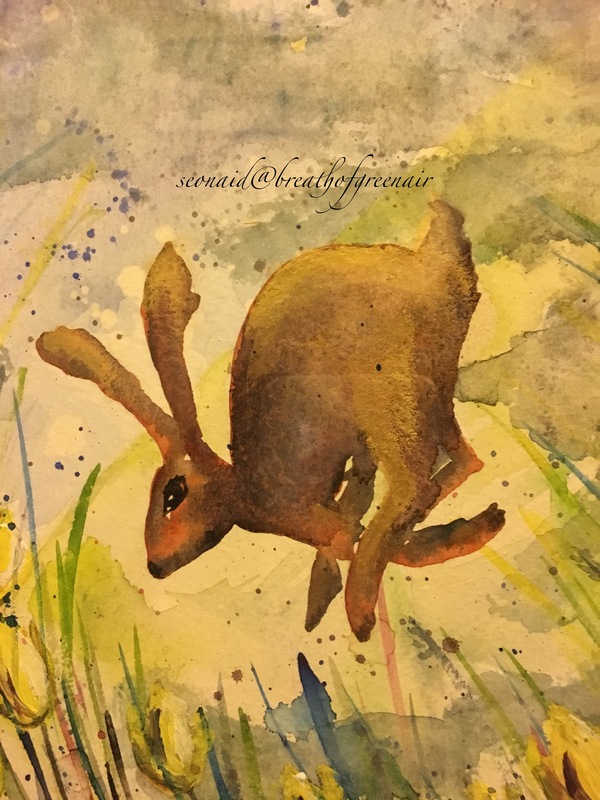 Beautiful watercolour – such a lovely hare! Lovely painting! I had no idea you paint as well. Great works and wishing you the best for the exhibition! Seonaid, this painting is so beautiful and expressive! Such warmth and joy! They are absolutely lovely…..something very primitive about them. Best of luck with the exhibition. Ooh…primitive….I like that, thank you! Sounds wonderful Jo…I’m right there beside you! He can lead me anywhere. I love both paintings, this hare doesn’t look as wild as the first one, Will there be more? They would make beautiful cards or even better put them on studio 6! Do you know Marina Kanavaki?http://marinakanavaki.com/ there’s a link to society 6 on her page. I bought one of her prints recently. Sorry I was using my phone at work earlier and called it studio rather than society! I love this post. Your artworks are so beautiful and full of life. Very lovely. Your beautiful pictures and words reach my heart. Now, if only I was brave enough to follow your rabbit. But it does sound like fun! Your pictures are gorgeous! Good luck with your exhibition! Thanks Gwynn, the fun has been in the creating! Thanks Colline, they go into the exhibition tomorrow!